Hydroformed ultra-high-strength steel in the 2015 Ford Edge’s roof rings and even stronger 1,300-megapascal steel in the B-pillar and rocker panel mean that the little crossover has some mighty ribs. And particularly of note for repairers whose customers or insurers are considering aftermarket parts on the popular car: The bumper is 1,300-MPa steel as well and is designed to push the cabin of the vehicle to the side, away from the point of impact. Ford has shown how an aftermarket bumper can different than OEM originals, according to 2010 Consumer Reports coverage, and the ultra-high-strength steel bumper on the Edge could also set a high bar for a generic trying to achieve the “like kind and quality” of the original. 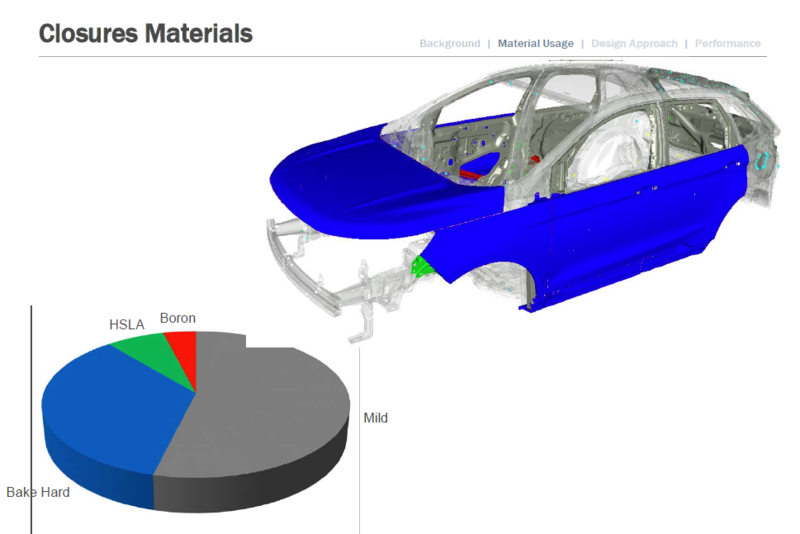 These were among some of the noteworthy next-generation materials and joining advances Ford’s John Reed described to the crowd (see presentation) at the Great Designs in Steel conference earlier this month – offering lessons for repairers as well as the OEM and steel executives present at the Livonia, Mich., event. 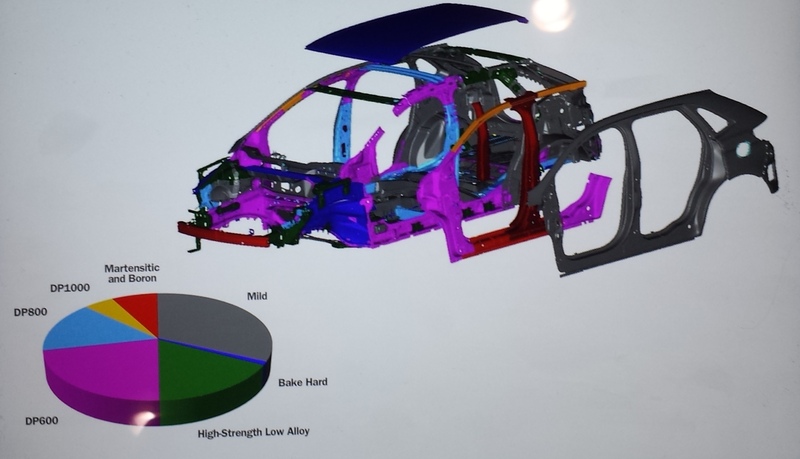 Two-thirds of the Ford Edge body is high-strength, low-alloy steel in the 270-340 MPa range (that type of steel can reach 550 MPa) or an even stronger metal, according to Reed. That can entail different repair procedures than the bake-hardened or truly mild steel. The hood and door panels are bake-hard steel in the 210-240 MPa range, according to Reed. As the name indicates, that’s slightly stronger than mild steel (and Reed said some closure reinforcement is 270 MPa-plus high-strength, low-alloy steel), which means that a driver might want to think twice before accepting an aftermarket part of undetermined strength. Another aftermarket consideration for the hood inner – can it correctly mimic the holes in the OEM version, done as a “significant effort” for lightweighting? 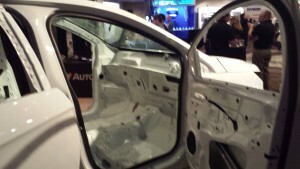 If not, the driver could lose fractions of gas mileage, not to mention risk an untested design during a frontal impact. “Lion’s foot”: The “lion’s foot” is tied to the rail structure and was adapted from the Fusion’s. Rail: The rear rail was strengthened for axial load carrying purposes. “We wanted it straight, smooth and clean,” Reed said. Joinings: Stampings were joined with laser welding to “mitigate the heat,” according to Reed. Heat can be detrimental to some high-strength steels, and this consideration can change repair and welding procedures for auto body shops. 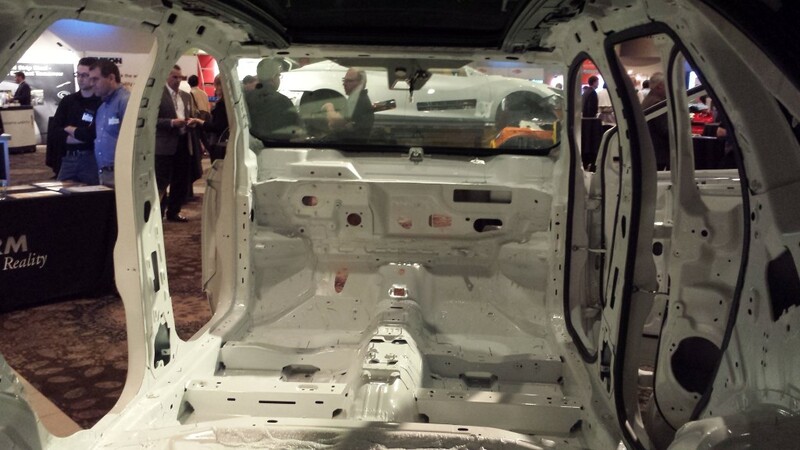 The 2015 Ford Edge has more than 27 yards of adhesives in the body-in-white. The glue between the body side outer and hydro-form A-pillar bolsters the welding, and extensive adhesive on the under body gives the Edge greater stiffness. Other joining: Nearly 4 yards of laser braze connect the roof to the body side, and a mix of 66 stitch and C-shaped welds can be found in the body side itself. There’s also 4,800 resistance spot welds, 192 projection weld nuts, 131 weld studs and 55 gas-metal arc welds.